season 1 as in 1963, where he has a granddaughter. 🙂 I just downloaded 2 and 3 as well. There may be missing episodes (I haven’t noticed) but season 1 contains 42 episodes, season 2 has 32, and season 3 has 46. Nice! I may have to check that out then…. How long do you knit your socks to when you put in the yarn for the afterthought heel? I’ve got some self-striping that I really want to do that to, and I’ve found afterthought heel instructions, but nothing about knowing where to place it. 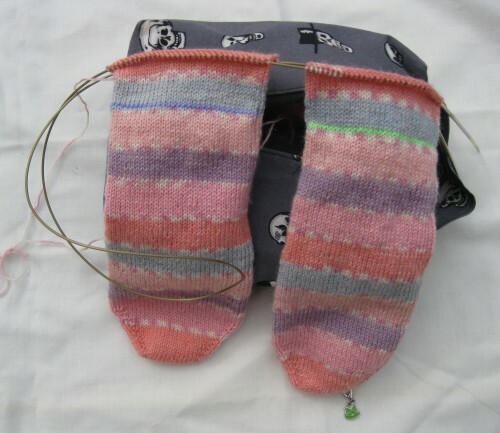 My feet are about 10″ total, so I usually knit my socks with about 1/2″ to 1″ negative ease. That means I’m shooting for a sock that is (in total) about 9″ to 9.5″ from toe to heel. After I’ve completed the toe and started a good inch up the foot, I measure the toe, then subtract that number from, say 9.5 (the larger size). So if the toe is 1.5″, then I knit for about 8 inches from the tip of the toe before I put in my waste yarn. If you can do so, try to get the waste yarn in a place that’s smack dab in the middle of one of the stripes, not on the edge like in my example above. Give yourself enough wiggle room to have a few extra rows – you’ll want to cement the heel into place with some extra picked-up stitches and a couple of extra rows anyhow, so stopping a little short of your estimated total inches isn’t really a bad thing. It’s why the Yarn Harlot doesn’t even put in the waste yarn…she just keeps knitting and measures afterwards (which is kinda what I wish I’d done, as the waste yarn is in the most inconvenient place to join yarn, damnit). – (length of foot – negative ease) – length of toe = approximate length to shoot for. 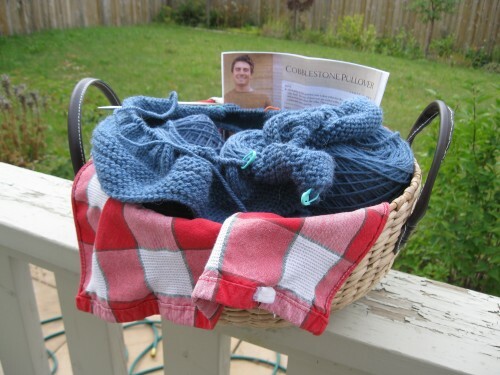 – Try to put in your waste yarn (or just snip) in the middle of a wide colour stripe rather than on the edge. – Give yourself a little leeway to add in a few extra rows.